Defense Minister Avigdor Liberman blasted Israeli Arab rioters who demonstrated on Saturday night against President Trump's decision to recognize Jerusalem as Israel's capital. The rioters threw rocks at cars and clashed with police while chanting "Palestine is ours". 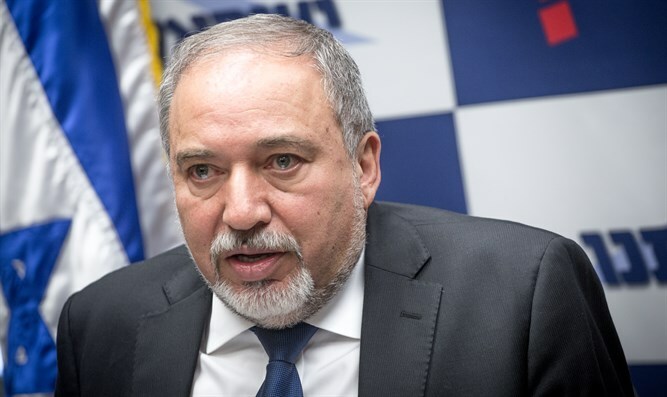 Speaking with Reshet Bet radio on Sunday, Liberman blasted the rioters, suggesting that "they move to the Palestinian Authority" and calling to boycott the Arabs living in the Wadi Ara region. "I call on all Israeli citizens not to enter their shops. Don't buy anything from them," declared Liberman. "We need to give them the feeling that they are not wanted." "Those who saw these riots and violence and the near-lynch of a journalist understand that these people have nothing to look for in the State of Israel, they must be part of the Palestinian Authority. Let them receive unemployment benefits and sick pay there," said Liberman. "We see how Israeli Arabs commit terror attacks on the Temple Mount and in the center of Tel Aviv, and the people doing this must understand that they are not wanted." Liberman was referring to July's terror attack on the Temple Mount by two Arab Wadi Ara residents that left two Druze policemen dead as well as the attack by Umm el-Fahm resident Nashat Milhem at a Tel Aviv bar in 2016 that killed three. Umm el-Fahm is a town is in the Wadi Ara area within pre-1967 Israel called the Triangle. Liberman denied that he was generalizing by calling to boycott all the Wadi Ara residents. "Let's not run away from reality," he said. "I remember the funeral of the terrorists in Umm al-Fahm from the Temple Mount attack. There were thousands of people attending who identified with their actions." Liberman also addressed Israel's purported ties with Saudi Arabia, saying that "At the end of the day, Saudi Arabia understands that the threat to them is not Zionism or Israel, but Iran and its satellites. Liberman has long promoted a plan that would switch Arab areas of Israel such as the Triangle and integrate them into a Palestinian state, in exchange for Jewish-populated areas of Judea and Samaria that would be annexed to Israel. “There is no reason for Umm el-Fahm to be a part of Israel,” Liberman once said, charging that the Wadi Ara residents are disloyal to the State of Israel.